Trivandrum, 12 October 2011: Trivandrum will have a new ship repair yard at Vizhinjam or Poovar soon. The decision was announced by Chief Minister Oommen Chandy in a high level meeting yesterday. 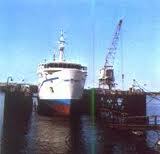 Cochin Ship Yard has been directed to do the initial studies on this regard and to submit the report within two months. The Rs. 1500 crore project aims to develop 150 acres of land at Vizhinjam or Poovar to develope a world class ship repair yard.